Is A Quilt Shop In My Future? 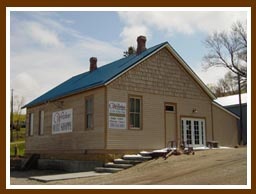 For a couple of years now I've been brainstorming about starting a Quilt Shop in Red Lodge Montana. This whole thing got started one day when I was up at our family cabin, sewing of course, and I forgot my seam ripper at home in Billings. When you're a quilter, having a seam ripper or some other handy UNSEW tool is a must. There is a lovely little quilt shop in Washoe, which is just over a hill (people in lowland country would call it a mountain), but it is closed on Saturday for religious reasons. I stopped in the town of Red Lodge and started hunting around for some other crafty store, or hardware store or somewhere that stocked some basic sewing supplies. I did find an empty spot on a tag board for "seam ripper" in the hardware store, but of course, they would be out of them that day. The town of Red Lodge is not very big, one main street, old fashioned and very quaint. I walked all over town and talked to many of the shop owners in my quest. It was an enlightening experience in that the trades people thought we needed a quilt fabric shop in town. Several had tried, but for some reason or another, they retired or moved. This whole adventure happened a couple of years ago, and since, I've been dreaming of a quilt shop in Red Lodge. I started attending classes at the National and International trade shows. Met with lots of people who are in the quilt shop business. It's not an easy thing to do, that's for sure. When I first started investigating, the quilt fabric economy was really struggling. Price for fabric was going up due to some cotton shortages and some quilt shops had put too much on their credit cards and were not able to pay their bills as they did when the fabric market was better. All of this kinda scared the daylights outta me, so I thought I should continue to study the situation and learn as much as I can. I have a time line plan that includes a quilt shop in Red Lodge for 2015, but then a funny thing has happened along the way. Stay tuned! This is the fabric I fell in love with awhile back and I'm trying to figure out what to do with it. I really want to make a quilt for a little girl, and in my dream, I suppose I would want this look if I was a little girl. I think this would look good in a strip quilt with maybe a row of some type of traditional block and some of the other fabrics that came with this line. If I make something that looks good, I'll use it as a display in the quiltlodge.com online quilt shop kit section I have a friend coming over today to quilt with me, and she always sews up things I dream up for me. So I better get to cutting and dreaming and get something done with this sweet fabric. When I saw this picture I strained to examine what kind of block was in the center light part of this tapestry. I know it's a tapestry, but to me it looks like a quilt. Those are very nice borders and I really love the center designs in gold. I think a quilter can look for a pattern and a design in just about anything. Nice to see the new Pope with his arms open in a welcome and comforting message above what looks like a quilt to me. I bet he blesses quilts as well! Congratulations Catholics, I'm a Luthern myself, so I'm almost a Catholic.